IBM as we know it now has been absorbing other companies since the early 1900s. The first IBM-related acquisition happened in 1899 when IBM precursor Bundy Manufacturing bought a company that made time clocks. As a reference point, that sale happened 34 years after the end of the Civil War. Since then, Big Blue has acquired a staggering amount of firms, including 47 since 2008. So if you’re looking for an exit, it wouldn’t hurt to see what kind of firms big enterprises are interested in. So how can we characterize those 47 acquisitions made from 2008 to today? This isn’t surprising. By now, most people are familiar with IBM’s reinvention as a software and services company. Tom Friedman devotes a few paragraphs to the metamorphosis in The World is Flat. Making the World Work Better, the IBM book given to every employee, belabors the point. Literally all of them have B2B business models. Again, enterprise software and services are IBM’s bread and butter. While people joke about the valley celebrating SoLoMo companies that don’t make any money, enterprise software firms have been laughing all the way to the bank. Anecdotally, I’ve noticed that some IBM products aren’t really the best available or the most user friendly. Anyone who’s used NetInsight or Lotus Notes can attest to that. Perhaps this is just a symptom of enterprise software in general: You don’t have to have the best product, you just need to convince a bunch of companies they need you. The enterprise market is ostensibly ridden with friction and inefficiency. After the sale is made, the product just has to do what it says on the box halfway decently. It doesn’t really matter if it’s slow and unintuitive. I’d really like to see UX lessons learned from bubblegum web startups osmose into the b2b domain . 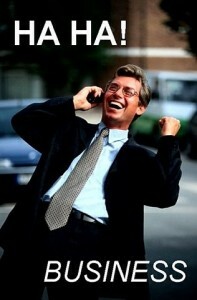 IBM buys established, profitable companies that have a lot of traction. These companies don’t look like they were “built to flip”. There is a very real, proven demand for the products or services. 60% are from the US. Of those 29, 8 are from Massachusetts and 8 are from Silicon Valley. It’s not surprising that Silicon Valley is well represented, but the Bay Area hardly has a monopoly. Only 17% of all companies acquired since 2008 were from the Valley. Massachusetts is home to MIT, Harvard and about 100 smaller schools. And local VC’s have a reputation for funding companies selling to big business. Of the “rest of the world” group, Israel is well represented. Haifa is known as a tech engine and IBM has a large research presence at the University of Haifa. In the next 20 years expect to see acquisitions from BRIC nations. India and China are producing very high numbers of engineering students with graduate degrees. The oft repeated argument that “they aren’t as innovative as us” is going to look pretty silly by 2030. The biggest reason we haven’t seen any BRIC acquisitions so far is because of the long incubation time mentioned above. 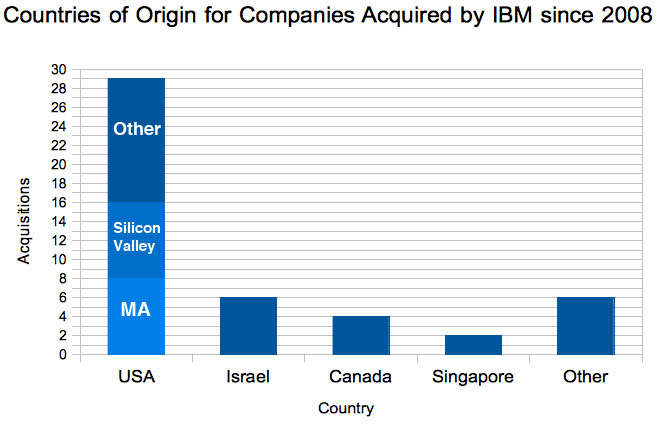 Many of the companies in emerging markets that IBM will acquire have likely already been founded. This post wouldn’t be complete without mentioning Austin. Since 2008 IBM’s only Austin acquisition was the 2009 purchase of Lombardi Software. Former Lombardi CEO Rod Favaron is now at Spredfast, a company worth mentioning because a) they do social for enterprise and b) they gave me a T-shirt. Note that both companies came out of ATI, a UT partnership with the private sector. And long before Lombardi there was the huge Tivoli merger in 1996. If you have the opportunity to see Frank Moss (former Tivoli CEO) speak, you should take it. He’s an interesting dude. And, strangely enough, he began his career working for IBM Research in Haifa. 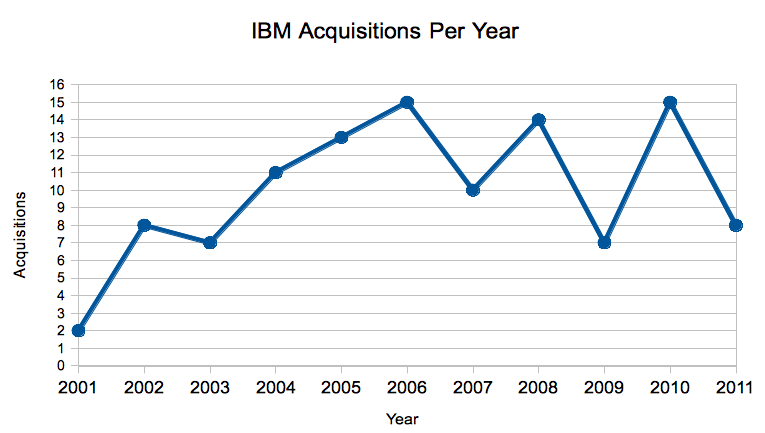 IBM likes to acquire established enterprise software firms that have been in business for over a decade. Their cities of origin are geographically diverse, but many are characterized by high availability of venture capital and a strong history of academic interaction with the private sector. Cringely just wrapped up a series of posts announcing the imminent downfall of IBM, due in part to its inability to deliver on service agreements. I expect software revenue will continue to grow and mitigate failures of global services. Cringely is pessimistic about all the software buys and doesn’t believe that IBM can turn new software products into billion dollar business. I disagree. The companies that IBM bought were profitable. There are enough smart people  at IBM to figure out how to assemble halfway decent software products into coherent packages that can be sold by a proven sales force. Update 3/23/2013: @miquelcamps has done some analysis of Crunchbase acquisition data. IBM is listed as the 4th largest acquirer behind Cisco, Microsoft, and Google. Most of data in this post comes from Crunchbase and Wikipedia. Mixpanel appears to be doing this. And Palantir claims to bring Silicon Valley level software to government. I just wrapped up a 2 year internship in IBM’s developerWorks.